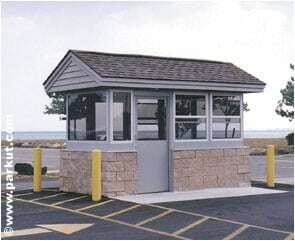 Pictured here is a 6′ x 12′ DNR boat ramp control booth. Par-Kut shipped this painted galvanized steel booth completely assembled with an HVAC system, UL classified electrical system, and pre-engineered the roof box and walls for field modifications. This pre-engineering allowed the contractor to easily install the desired, site matching, gable roof design, shingles and block wall treatment.